← Everybody’s workin’ for the weekend! Was anyone else completely glued to their TV’s on Friday? I came home from work and was greeted by Joe’s parents who had flown in around noon! CNN was on and I was immediately sucked in! We watched the entire thing unfold for about 2 hours until the second suspect was apprehended. I think immense relief is felt by everyone at this point. Earlier in the day I followed in this girls footsteps and ordered a Boston shirt (all proceeds going toward the Emergency Medicine Fund at Massachusetts General Hospital, which supports the patients and families affected by the Boston Marathon tragedy. After peeling ourselves away from the news, we walked downtown for dinner at the Denver Chop House. 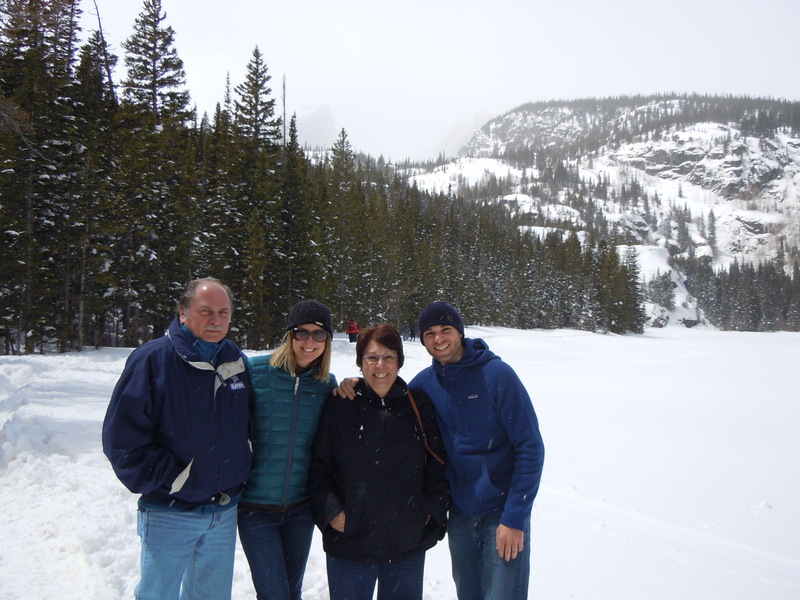 Saturday morning we headed to Rocky Mountain National Park to show Joe’s parents the beautiful mountains we now live in! And of course, there were elk just walking around town…… After leaving the park, we headed to Boulder to show them where we plan to live one day 🙂 We walked around and checked out all the fun shops on Pearl Street Mall….it was a beautiful day! We took them into the Boulderado Hotel, which is a super old, saloon like hotel right downtown. I would love to stay there sometime! After another incredible dinner, we headed back to Denver and I immediately went to bed…totally pooped! Sunday morning we got a slower start. Joe and I went for a 8 mile run and then we all headed to Mona’s for brunch. From there we walked downtown and did a little window shopping. Next stop was Coors Field for our first ever Rockies Game!! So much fun!! After the game we walked into Larimer Square for dinner and then ended the night with a trip to the best ice cream spot in Denver; Little Man. Of course there was a line down the block! gosh girl.. you really know how to advertise Colorado well!!!! Safe travels to Joe’s family, and to him on his trip as well. What a fun weekend! I’m so jealous that Joe will run with you, and what an awesome run! Sounds amazing! I was glued to my TV Friday too…that was such great news to start the wknd!! You had such a nice weekend!! Busy! Baseball games are so much fun! I know! I hadn’t been in a long time and it was perfect weather for it too! I was totally tuned in to the television 24 hours a day last week, especially Friday. I still can’t get over it all. I am just so glad it’s over….and I hope it truly is! Totally relived for sure…it will be interesting to see what comes next with this whole situation!